Awesome Awesome .We loved our stay,very friendly and polite. Excellent place.cherri at the desk was very helpful, hope you’re feeling better. The manager was very nice and tried to accomodate our needs. The musty odor in both of the rooms we were shown was too overbearing for my sister and I. The state of the rooms were cleary old and at best tattered and worn. 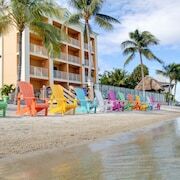 Located on a barrier island reef 7 miles from downtown Stuart, this 200-acre resort is flanked by the Atlantic Ocean and the Intracoastal Waterway. Beautiful luxury on the beach We thoroughly enjoyed every aspect of our stay! The place was magnificent the food was delicious and the place was relaxing and beautiful! nice hotel for the price. the staff was fiendly and took care of a minor issue in our room quickly. Lots of restaurants close to the hotel. Romm was very clean. Really grest spot. Right on the beach. Deck, pool, and ocean all outside your door. No frills, but just what we needed. Very ditry. They didnt even clean the room. I was disgusted, will not stay here again. Cheap, cheap, cheap! No matter what you're searching for, we've got the savings for your spectacular vacation in Vero Beach. You'll find it approximately 300 miles southeast of Tallahassee, the state capital of Florida, and around 15 miles southeast of Fellsmere. Love meeting the locals while you're on vacation? This area of Central East Coast Florida is home to around 15,000 residents. Whether you're looking to escape a wet-weather day or learn a thing or two, you'll love the Indian River Citrus Museum, the Vero Train Station and the Old Vero Man Museum. And remember — these establishments don't charge entry fees! Take a leap into the past and explore Hallstrom Farmstead. This long standing site is a good place to get a taste of local history without needing to shell out for costly fees or tickets. Indian River County wetlands is a fantastic spot if you'd like to stretch those legs and get some exercise. There's nothing lovelier than getting out into nature's fresh air! Check out the unique species of flora and vegetation at the Harbor Branch Ocean Discovery Center, Royal Palm Pointe Park, Pepper Park Riverside and Oslo Riverfront Conservation Area. These flourishing places are great for horticulturalists or anyone else interested in plants. CheapTickets is where vacations begin — our job is to turn your frugal dreams into a reality. 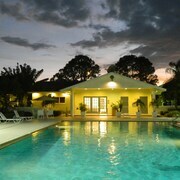 We're madly budget focused, and we refuse to make sacrifices on quality for hotels, flights and wonderful experiences. Want a world of options on flights and hotels? Our 500 airline partners and 500,000 properties across the globe can give that to you. 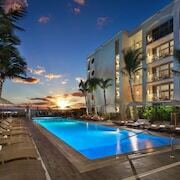 You can even save up to $481 when you combine your bookings into a package. You come to CheapTickets for the hottest deals, and we make sure you bag them with our Price Guarantee. If you end up finding your vacation package elsewhere for a cheaper price within 48 hours, we'll reimburse the difference. What could be more exciting than securing the cheapest deal around? A cheap deal plus rewards! With our rewards program, you'll be able to save dollars on your next CheapTickets hotel stay just by booking flights. Using our CheapCash rewards program couldn't be any simpler. Sign up (for free!) or log in, and you'll immediately qualify to save on all eligible bookings, as well as being first in line to hear about other amazing bonus offers and penny-pinching perks! So, cheapster — you're not enthusiastic about slow public transportation, but you need an economical way of getting about in Vero Beach, right? Why not take in the sights from the comfort of a rental car? It's much more fun than sitting on a bus or train, plus you get to control the tunes! If you're arriving by plane, you can easily collect a vehicle from Vero Beach Municipal Airport. Avis is a reliable outlet. Avis is located right in the middle of the city at 1006 21St St Miracle Mile Us 1. This makes it a fantastic option for those staying central. 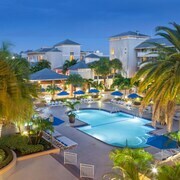 If you'd like to stay a few nights, you ought to know there are only 13 hotels in Vero Beach. We can help you secure a cheap and cheerful room, but you'll need to act quickly! Why throw around big bucks when you don't need to? 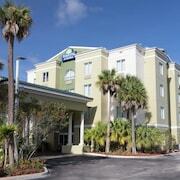 Set yourself up in one our cheap options like the Prestige Hotel Vero Beach or the Econo Lodge.